You may or may not know that Lightning Experience actually already provides some standard keyboard shortcut cuts? Just press Cmd+/ (Mac) or Ctrl+/ (Windows) to get a nice summary of them! However, per the standard shortcut documentation, it’s not possible to add custom ones. By using the new lightning:backgroundUtilityItem interface we can rectify this. 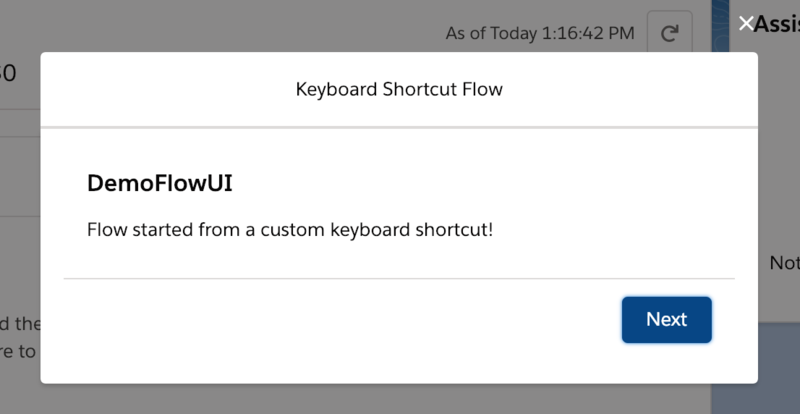 This blog explains a basic hardcoded example component and also introduces an open source component (installable package provided) that links admin defined keyboard shortcuts to Flows and certain navigation events. The component controller simply uses the standard addEventListener method. You can also inspect the keydown event properties to determine what keys are pressed, such as Shift or Control plus another key. This example simply determines if H is pressed and navigates to Home. Once deployed go to the App Manager under Setup and add the component to the Utility Items list and that’s it! Note that the component has a different icon indicating it’s a non-visual component. Neat! Of course, I could not simply leave things like this, so I set about making a more dynamic version. The configuration of the Custom Keyboard Shortcut component is shown at the top of this blog. It’s leveraging the fact that when you configure a Utility Bar component the App Manager inspects the .design file for the component to understand what attributes the component needs the user to configure. At runtime, the controller logic then parses the 9 attributes containing the keyboard shortcuts entered by the user into an internal map that is used by the keyboard event handler to match actions against keyboard activity. Once you have installed the component either via a package install (admin friendly) or via sfdx force:source:deploy (devs). Add the component within the App Manager to configure keyboard shortcuts. Further details on configuring the component can be found in the README here. Finally, you may recall that I used a Background Utility in this years Dreamforce presentation. In this case, it was using the new Streaming Component to listen to Platform Events. You can find the source code here. Categories: Dreamforce, Force.com, Lightning, Tools, UtilityBar | Permalink. Its been nearly 9 years since i created my first Salesforce developer account. Back then I was leading a group of architects building on premise enterprise applications with Java J2EE and Microsoft .Net. It was fair to say my decision to refocus my career not only in building the first Accounting application in the cloud, but to do so on an emerging and comparatively prescriptive platform, was a risk. Although its not been an easy ride, leading and innovating rarely is, it is a journey that has inspired me and my perspective on successfully delivering enterprise applications. Clearly since 2008 things have changed a lot! For me though, it was in 2014 when the platform really started to evolve in a significant way, when Lightning struck! It has continued to evolve at an increasingly rapid pace. Not just for the front end architecture, but the backend and latterly the developer tooling as well. Decomposing code into smaller reusable units is not exactly new, but has arguably taken time to find its feet in the browser. By making Lightning Components the heart of their next generation framework, Salesforce made decomposition and reuse the primary consideration and moved us away from monolithic page centric thinking. Components need a place to live! With the increase of usability features in the various Lightning containers, namely Experience, Mobile and Community, we are further encouraged to build once run everywhere. Lightning Design System has not only taken the leg work out of creating great UI’s, but also brings with it often forgotten aspects such as keyboard navigation and support for accessibility. Metadata has been at the heart of Salesforce since the beginning, driving it forward as low code or zero code, high productivity platform for creating solutions and applying customisations. When Salesforce created Custom Metadata, it enabled developers to also deliver solutions that harness these same strengths that has made the platform so successful, driving up productivity and easy of implementation and time scales down. Decomposition of processing is key to scalability and resiliency. While we often get frustrated with the governors, especially in an interactive/synchronous context, the reality is safe guarding server resources responsible for delivering a responsive UI to the user is critical. Batch Apex, Future and Queables have long since been ways to manage async processing. With Platform Events, Salesforce has delivered a much more open and extensible approach to orchestrating processing within the platform as well as off platform. With a wealth of API’s for developers on and off platform, and tooling integration, EDA is now firmly integrated into the platform. Retry semantics with Platform Events is also a welcome addition to what has previously been left to the developer when utilising the aforementioned technologies. Salesforce has always been strong in terms of its own API’s, the Enterprise and Partner API’s being the classic go to API’s, now available in REST form. With External Objects and External Services supporting the OData and Swagger industry standards, off platform data sources and external API’s are obtained at a much reduced implementation overhead. Also without the user having to leave behind the value of various platform tools or the latest Lightning user experience. The tooling ecosystem has been a rich tapestry of story telling and is still emerging. The main focus and desire has been to leverage other industry standard approaches such as Continuous Integration and Deployment, with varying degrees of success. With SalesforceDX going GA, the first wave of change is now with us, with the ability to define, create, manage and destroy development environments at will. With more API’s and Services allowing for richer IDE experiences to be built in a more open and IDE agnostic way. I am very much looking forward to the future of DX, especially upcoming improvements around packaging. Last but not least, many of the above advancements provide more secure, responsive and integrated options for leveraging services and capabilities of other cloud application platforms. Heroku is the natural choice for those of us wanting to stay within the Salesforce ecosystem. With both Heroku Connect and Salesforce Connect (aka External Objects) integrating and synchronising data is now possible at much greater easy and reliability. Platform Events and External Services also both provide additional means for developers to connect the two platforms and take advantage of broader languages, libraries and additional compute resources. FinancialForce has open sourced an exciting new library, Orizuru, to assist in integrating Force.com and Heroku that will be showcased for the first time at Dreamforce. The above list is certainly not exhaustive, when you consider Big Data (Big Objects), Analytics (Einstein/Wave Analytics) and of course AI/ML (Einstein Platform). Its a great time to being heading into my 5th Dreamforce i am sure the list will grow even further! I will be presenting in the following sessions at Dreamforce 2017. Up close and personal with Lightning Experience as Platform! FinancialForce R&D is out in force once more, see the full session list here! Categories: Custom Metadata, Dreamforce, External Services, Force.com, Heroku, Lightning, Salesforce API, Tools, Web Services | Permalink. Winter’16, Lightning, Custom Metadata, Dreamforce, IoT, Social Coding… its all go! So as is the norm in the run up to Dreamforce things are pretty busy! I thought i’d share a little summary of whats going on and what to look out for in the coming weeks before Dreamforce and in the weeks after as the mighty Winter’16 release rolls out! The Custom Metadata team in Salesforce continue to invest in this great feature i’ve blogged already a few times about. I’m very pleased to see native UI support for it in this release! Below is a selection of screenshots showing the Custom Metadata Type from my last blog, now in my Winter’16 preview org. While there are some gaps, the native UI compared to a Custom Object native UI is pretty good. If your interested in know more about my thoughts on this for the tool i’ve started a GitHub discussion here. Then of course who can ignore the Lightning Experience announcement, a bold new user experience! For sure inspired by the current Salesforce1 Mobile application, and built on the same framework, namely Aura. If you’ve been developing Lightning Components, now things really start to get exciting! As Salesforce continues on its mission to make Lightning a true device agnostic platform, your components are now not just for mobile users! There is a useful Lightning Experience FAQ from Salesforce here, and you can start reading up on Lightning Experience over at Trialhead now. In preparation for my Dreamforce session above, the LittleBits Connector for Salesforce has been enhanced, and its now making plugging together my use cases a true joy, i can add new devices, subscribe to events from them in seconds, just they way a Clicks not Code solution should be! Check out my last blog for more details. 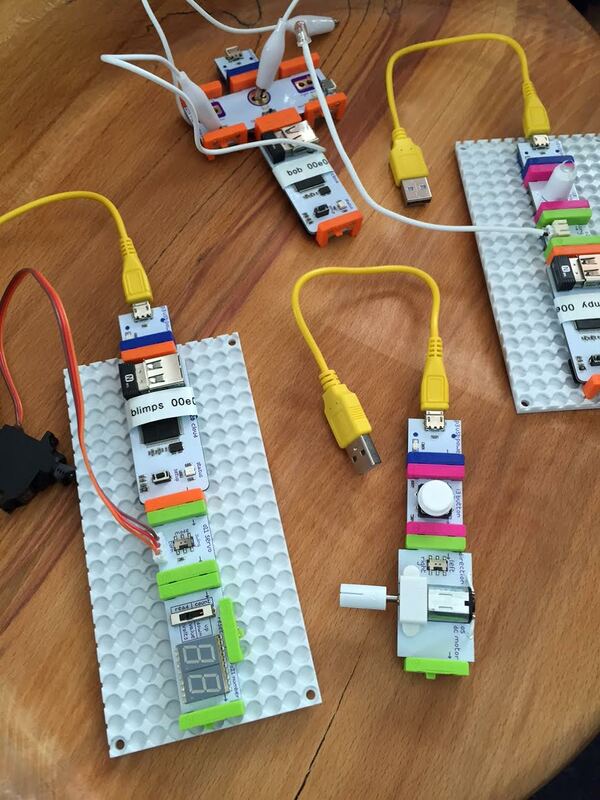 Working with LittleBits i’ve got some great kit and demos to bring to Dreamforce, that will really i hope entertain and encourage you to get more involved in the every growing world of IoT. So if you want to take part as well as learn about IoT please join my session, where a hand shake really does close an opportunity…. Increasingly my Salesforce community time is spent responding to questions, ideas and submissions via my GitHub profile page. Repositories such Apex Enterprise Patterns, Apex Mocks, Declarative Rollup Summary Looks and of course Apex Metadata API are all seeing increased traffic and an increasing amount of submissions from fellow community developers, such as the mighty Jon Davis (here and here). I’m so proud to see this happening and its one of my favourite ways to spend my community time (in addition to playing with LittleBits at the moment!). Today i released v1.23 of Declarative Rollup Summary tool, with a solid set of enhancements and bug fixes from Jon, the tools latest prolific contributor. Yes there is! But you’ll have to join myself and FinancialForce at Dreamforce to find out about other developments that have been keeping several other FinancialForce developers and myself very busy these last few weeks…. Categories: Custom Metadata, Design Patterns, Dreamforce, Fun Stuff, Iot, LittleBits | Permalink. I have been wanting to explore Custom Permissions for a little while now, since they are now GA in Winter’15 i thought its about time i got stuck in. Profiles, Permission Sets have until recently, been focusing on granting permissions to entities only known to the platform, such as objects, fields, Apex classes and Visualforce pages. In most cases these platform entities map to a specific feature in your application you want to provide permission to access. However there are cases where this is not always that simple. 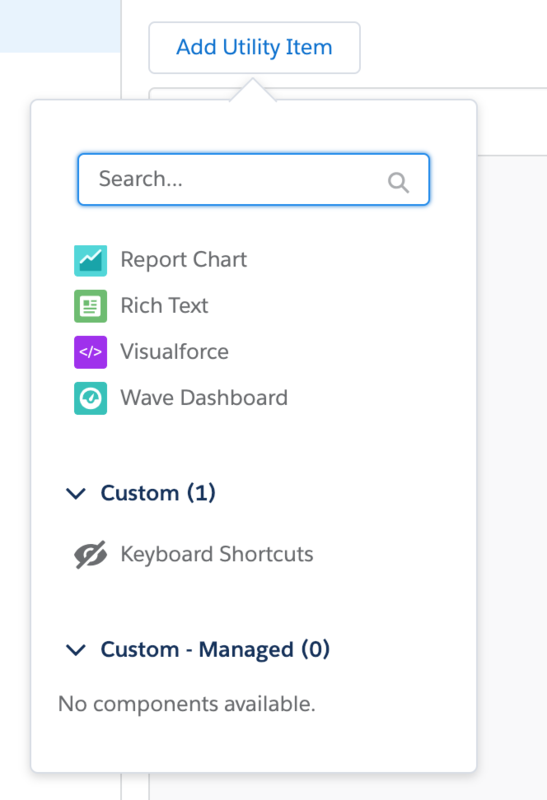 For example consider a Visualforce page you that controls a given process in your application, it has three buttons on it Run, Clear History and Reset. You can control access to the page itself, but how do you control access to the three buttons? What you need is to be able to teach Permission Sets and Profiles about your application functionality, enter Custom Permissions! NOTE: That you can also define dependencies between your Custom Permissions, for example Clear History and Reset permissions might be dependent on a Manage Important Process custom permission in your package. Once these have been created, you can reference them in your packaged Permission Sets and since they are packaged themselves, they can also be referenced by admins managing your application in a subscriber org. The next step is to make your code react to these custom permissions being assigned or not. You can use the $Permission from a Visualforce page or as SFDCWizard points out here from Validation Rules! 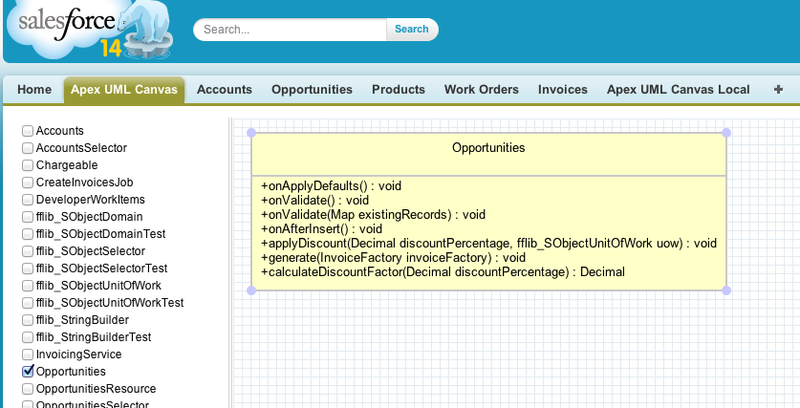 Here is the Visualforce page example given by Salesforce in their documentation. IMPORTANT UPDATE: Since API 41 (Winter’18) there is now a native way to read Custom Permissions. The following may still be useful if you have requirements not met by the native method. FeatureManagement.checkPermission. 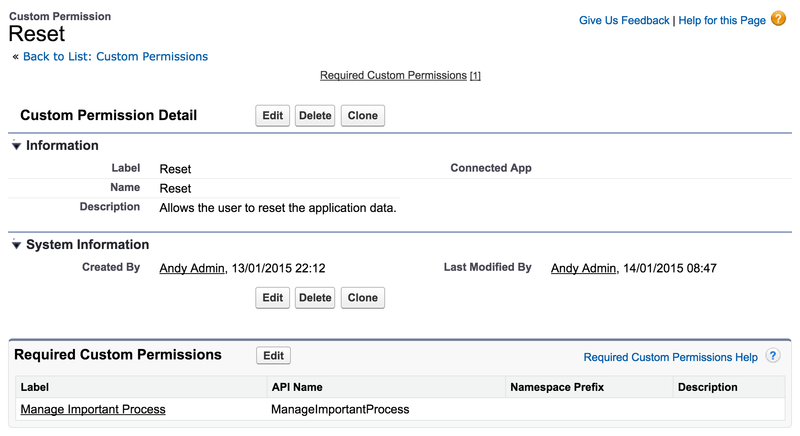 In the case of object and field level permissions, the Apex Describe API can be used to determine if an object or field is available and for what purpose, read or edit for example. This is not going help us here, as custom permissions are not related to any specific object or field. The solution is to leverage the Permission Set Object API to query the SetupEntityAccess and CustomPermission records for Permission Sets or Profiles that are assigned to the current user. The following SOQL snippets are from the CustomPermissionsReader class i created to help with reading Custom Permissions in Apex (more on this later). As you can see you need to run two SOQL statements to get what you need. The first to get the Id’s the second to query if the user actually has been assigned a Permission Set with them in. Now personally i don’t find this approach that appealing for general use, firstly the Permission Set object relationships are quite hard to get your head around and secondly we get charged by the platform to determine security through the SOQL governor. As a good member of the Salesforce community I of course turned my dislike into an Idea “Native Apex support for Custom Permissions” and posted it here to recommend Salesforce include a native class for reading these, similar to Custom Labels for example. In the meantime I have set about creating an Apex class to help make querying and using Custom Permissions easier. Such a class might one day be replaced if my Idea becomes a reality or maybe its internal implementation just gets improved. One things for sure, i’d much rather use it for now than seed implicit SOQL’s throughout a code base! Its pretty straight forward to use, construct it in one of two ways, depending if you want all non-namespaced Custom Permissions or if your developing a AppExchange package, give it any one of your packaged Custom Objects and it will ensure that it only ever reads the Custom Permissions associated with your package. You can download the code and test for CustomPermissionsReader here. Like any use of SOQL we must think in a bulkified way, indeed its likely that for average to complex peaces of functionality you may want to check at least two or more custom permissions once you get started with them. As such its not really good practice to make single queries in each case. For this reason the CustomPermissionsReader was written to load all applicable Custom Permissions and act as kind of cache. In the next example you’ll see how i’ve leveraged the Application class concept from the Apex Enterprise Patterns conventions to make it a singleton for the duration of the Apex execution context. Here is an example of an Apex test that creates a PermissionSet, adds the Custom Permission and assigns it to the running user to confirm the Custom Permission was granted. Those of you familiar with using Apex Enterprise Patterns might be wondering where checking Custom Permission fits in terms of separation of concerns and the layers the patterns promote. The answer is at the very least in or below the Service Layer, enforcing any kind of security is the responsibility of the Service layer and callers of it are within their rights to assume it is checked. Especially if you have chosen to expose your Service layer as your application API. This doesn’t mean however you cannot improve your user experience by using it from within Apex Controllers, Visualforce pages or @RemoteAction methods to control the visibility of related UI components, no point in teasing the end user! The following code uses the Application class concept i introduced last year and at Dreamforce 2014, which is a single place to access your application scope concepts, such as factories for selectors, domain and service class implementations (it also has a big role to play when mocking). This approach ensures their is only one instance of the CustomPermissionsReader per Apex Execution context and also through the properties it exposes gives a compiler checked way of referencing the Custom Permissions, making it easier for application developers code to access them. Finally, as a future possibility, this approach gives a nice injection point for mocking the status of Custom Permissions in your Apex Unit tests, rather than having to go through the trouble of setting up a Permission Set and assigning it in your test code every time as shown above. While writing this blog I created one Idea and came across a two others, i’d like to call you the reader to action on! Please take a look and of course only if you agree its a good one, give it the benefit of your much needed up vote! Categories: Apex, Best Practice, Design Patterns, Dreamforce, Packaging, Permission Sets, Visualforce | Permalink. Complex code can easily get out of hand without good design, so in this deep dive you will better understand how to apply the advanced design patterns used by highly experienced Salesforce developers. Starting with Interface & Base Class examples of OO design we quickly move on to new design features including: Application Factory, Field Level Security Support, Selector FieldSet support and Dependency Injection, Mock Testing of Services, Domain and Selector layers.​ By the end you will have a better understanding of how and when to apply these advanced Apex patterns. I’m quite excited about all this content, but perhaps if pushed, i’d have to highlight the new Application Factory concept along with the integration with the exciting new ApexMocks library (also from FinancialForce.com R&D). This brings with it easier support for implementing polymorphic use cases in your application and the ability to mock layers of the patterns, such as Unit Of Work, Domain, Selector and Service layers. Allowing to develop true unit tests that are fast to execute by the platform and plentiful in terms of the variation of tests you’ll be able to develop without fear of extending the time your sat waiting for tests to execute! Its is against my nature to publish a blog without a code sample in it, so i’ll leave you to ponder the following…. Here is a more generic service layer example, leveraging polymorphic Domain classes! This last example shows how ApexMocks has been integrated into Application Factory concept via the setMock methods. The following is true test of only the service layer logic, by mocking the unit of work, domain and selector layers. All these examples will be available in the sample application repo once i’ve completed the prep for the session in a few weeks time. Sadly the FinancialForce.com session on ApexMocks was not selected for Dreamforce 2014, however not to worry! FinancialForce.com will be hosting a DevTalk event during Dreamforce week where Jesse Altman will be standing in for the library author Paul Hardaker (get well soon Paul! ), book your place now! Finally, if you have been using the patterns for a while and have a question you want to ask in this session, please feel free to drop your idea into the comments box below this blog post! Categories: Apex, Best Practice, Design Patterns, Dreamforce | Permalink. 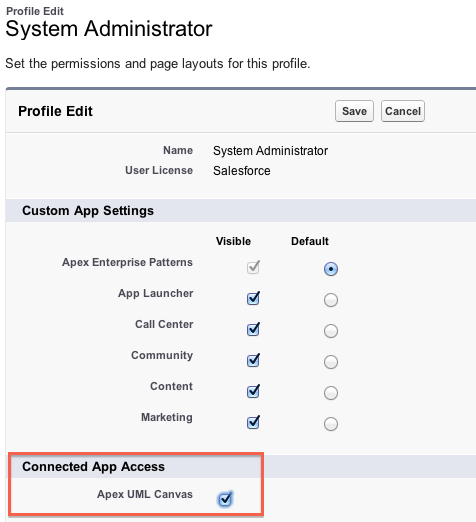 Apex UML Canvas Tool : Dreamforce Release! Update: Dreamforce is over for another year! Thanks to everyone who supported me and came along to the session. Salesforce have now uploaded a recording of the session here and can find the slides here. As those following my blog will know one of the sessions I’ll be running at this years Dreamforce event is around the Tooling API and Canvas technologies. If you’ve not read about what I’m doing check out my previous blog here. I’ve now uploaded the code to the tool I’ve developed that will be show casing these technologies. I’ll be walking through key parts of it in the session, please do feel free to take a look and give me your thoughts ahead or at the session if your attending! You now also install the tool as a managed package into your development org by following these steps. Install the package using the package install link from the GitHub repo README file. Installed is a tab which shows a Visualforce page which hosts the externally hosted (on Heroku) Canvas application. You need to configure access to the Canvas application post installation, you can follow the Salesforce guidelines on screen and/or the ones here. Click the link to configure and edit the “Admin approved users are pre-authorised” option and save. The tool displays a list of the Apex classes (unmanaged) in your org on the left hand side, tick a class to show it in the canvas. Move the Apex class UML representation around with your mouse, if it or other classes reference each other lines will be drawn automatically. There is some issues with dragging, if you get mixed up, just click the canvas to deselect everything then click what you want. It is quite basic still, only showing methods, properties and ‘usage’ relationships and really needs some further community push behind it to progress a long line of cool features that could be added. Take a look at the comments and discussion on my last post for some more ideas on this. Look forward to see you all at Dreamforce 2013! Categories: Apex, Canvas, Dreamforce, Heroku, Tooling API, Tools | Permalink.